I drink a lot of MadTree. If you'll recall, I am a huge fan of the brewery. Maybe this is because I live in such close proximity to their taproom (it's less than a five minute drive from my apartment). Or, more likely, it's because MadTree brews such damn good beers. The furry, white blob the left of the can is my cat Háma. 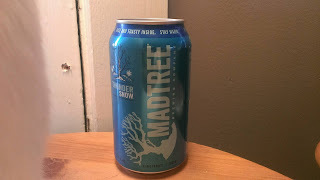 As such, when I learned that MadTree had a winter seasonal on the market, I jumped at the chance to have some. And I did--I went to their headquarters and had a pint of it on nitro. Now I have a can of it open before me. I know it won't be as creamy as it was on tap (due to the lack of nitrogen in the can). But, does it still hold up? In the MadTree post linked above (for Sol Drifter, their summer seasonal) I mentioned that the brewery believes in the community in which it operates and, as such, does a lot for the benefit of it. I did make it to the psycHOPuppy event I mentioned in that post, and have attended a few benefit events at the taproom since. MadTree wants to be a pillar in the community, and I'd say that, without a doubt, they are. They also make a hell of a beer, to boot. Take Thundersnow, for example. The official page for the 8.5% ABV giant boasts that the ale contains ginger, vanilla, cinnamon, and nutmeg. The can I have states that it's a "Spiced Scottish Ale" but I could swear that the sign for it in the taproom calls it a winter warmer. Regardless of how you classify the beer, Thundersnow smells delicious. Creamy chocolate makes up the ale's aroma. Notes of vanilla and nutmeg help to round out, and balance, the the character of its scent. Purrl, who gave the brew six whiffs, seems to enjoy it almost as much as me. 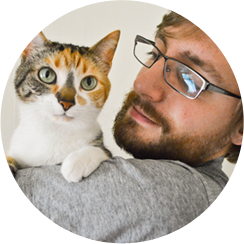 Háma makes a second appearance in this post! It has a warm flavor, brought on by its high ABV (if you've had a high ABV beer, you know what I'm talking about). Beyond that, I find obvious vanilla, nutmeg, and ginger in my swig. The cinnamon doesn't stand out to me. If I try really hard, I can find the chocolate I identified in the aroma in the ale's finish. 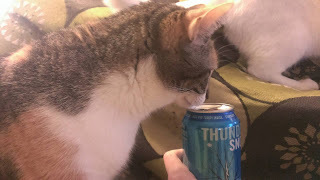 But, even without trying to find it, Thundersnow is tasty brew nonetheless. On nitro, this ale is undeniably creamy. I'm very happy to say that it's still creamy from the can, delivered through traditional carbonation. During the winter while I was pursuing my first master's degree, my then-girlfriend (now fiancee) and I went on a stint of running at night. We lived in a quiet neighborhood on the east side of Athens. It was never very late when we'd leave our apartment (for the few weeks we embarked on these night-time runs we'd leave around 10 and get back around 10:30) but our neighborhood was always dead. It was like, for the brief time we'd be out running, we had the snow-covered world to ourselves. I find a similar feeling of unbridled wintery possibility in this seasonal ale. MadTree's Thundersnow is, put simply, a joy. It's another impressive offering from a brewery that has firmly cemented its place in my top-tier breweries list. I'm giving the winter ale a 9.0/10. It's great and, should you be given the opportunity, you owe it to yourself to try it.